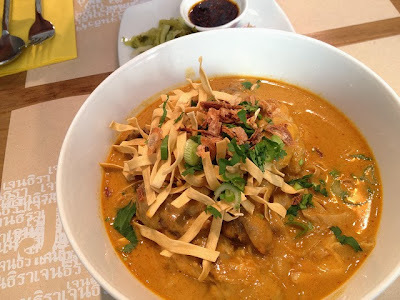 In my travels in Thailand, I never came across Khao Soi noodles, but then I never went anywhere further north than Bangkok. This noodle dish is typical of the Chiang Mai and northern Laos regions, and are also much like (and probably derived from) the Burmese 'ohn no khao swe', one of the Burma's most famous dishes. I first tried this dish at Janetira Thai on Brewer Street in Soho over the summer and was instantly hooked. 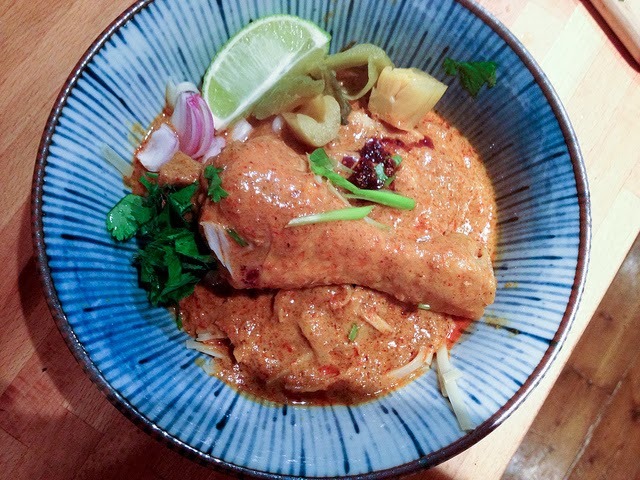 It's a rich, filling dish; chicken is simmered in coconut milk with a spicy curry paste until the sauce is thick and the meat is tender. This sauce is ladled over fresh egg noodles and garnished with crispy fried noodles, bright, crunchy pickled mustard greens and vibrant pink shallots. So on a wet, windy and cold night, I needed something warm and comforting. While some might veer towards meaty stews, my thoughts often stray to something Asian and spicy. 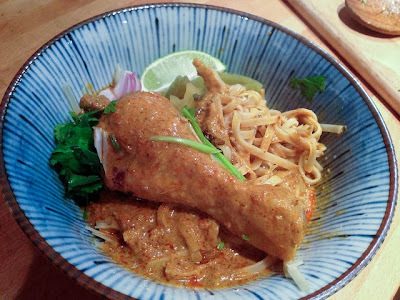 I cheated with shop-bought Mae Ploy red curry paste and added additional flavourings to pep it up a bit, which turned this into an easy and quick mid-week dinner. Home-made curry pastes with fresh ingredients are invariably better, but this was a great fix. My local Asian supermarket was all out of fresh egg noodles so I used dried, and subsequently couldn't be bothered to cook and then fry a portion of the noodles for the crispy garnish. My laziness was detrimental to the enjoyment of the dish - a little crunch contrast to the egg noodles goes a long way. That showed me. Bash the tumeric with the ginger and the curry and coriander powders, then mix in the red curry paste. Don't shake the tin of coconut milk up - you want the separation of the coconut cream from the milk. If you have this, open the can and skim it off the top. Add to the wok and fry it for a couple of minutes, then add the curry paste and fry for 5 or so minutes. If your can of coconut milk hasn't separated, then no worries - use a quarter of the coconut milk and simmer down for 10 minutes until thickened, before you add the curry paste. Add the chicken legs and cover the chicken legs with the sauce well. Add the rest of the coconut milk, black cardamom pod, kaffir lime leaves and the tins of water / stock, and simmer gently for 40 minutes, turning the chicken legs every so often. Add the palm sugar and fish sauce bit by bit, tasting as you go along. Meanwhile, for the fresh egg noodles, fry the reserved noodles in a little oil until crisp. Place on kitchen towel to drain. For the rest of the noodles, add to boiling water, boil for a couple of minutes and drain. Divide into bowls. Bring the chicken curry up to a rapid simmer. Add a chicken leg to each bowl, then ladle the sauce over equally. Serve with the accompaniments on the table for everyone to add bits and pieces to their liking. I found a squirt of lime was essential. Nahm and Bo Lan, but I'm sure they are already on your list. The bar on the roof of the Banyan Tree hotel is worth a drink before dinner at Nahm, but I'm sure someone has already told you that too! I spent three months in Thailand and found the best thing was just to dive into local restaurants, pull up a stool on the street, buy some vouchers in a food court and snack on the street. I can recommend some places at the northern end of the Skytrain, but they probably aren't any better than other parts of the city. This looks wonderful. May I ask what kind of camera do you have? Gimme!! Crispy noodle or no crispy noodle. Ed - thanks! Don't forget the crispy noodle. Anon - it's my iphone camera put through a smidge of Lightroom. I would save as much money as you can (6 weeks deposit is usually required) and then look for house shares, perhaps in cheaper areas - New Cross, Brockley, Lewisham, Green Lanes, etc. They're the cheapest I've come across, perhaps because they're seen as less desirable, though all the ones listed have their charm. But you're right, London is, unfortunately, very expensive. Gumtree, move-flat.co.uk are good places to look. Good luck! Helen - CRISPY NOODLE! Swap you for a turd? If you're in Bangkok go visit the various noodle stalls on the edge of and in Chinatown. Best one I went to was near a school when I got hopelessly lost. I couldn't get black cardamom pods, shall I used green or none at all? Thanks. Black cardamom is smokier than green, so I would leave it out. I don't think it'll make or break the recipe, just nice to have. Wow! Black cardamom are as easy to get as green in my experience and I live in the sticks. Lizzie....I was told that Janetira is "under consctruction". When are they re-opening or finnishing renovation? Looks great, a spicy bowl of goodness is just the thing for when the weather turns brrrr. Will def be trying this. I thought I posted a query about this restaurant but it hasn't appeared. I was wondering when it re-opens after restoration? OK maybe you don't know then fair enough. But when I lived in BKK some 10 years ago, I just ate in local cafes/restaurants including some Indian and Chinese ones. Fantastic place. I wish I was going too. The best Mussaman Curry I ate was made by a lady cooking it more or less road-side and charged the equivilent of 70p or so. Catherine - Great! Let me know when you do, would love to hear what you think. this looks AMAZING, had it at Janetira a little while back, SO GOOD and I will TRY THIS. Apols for shouting, a bit over excited there.